The Street Department will provide our citizens with great services throughout the year. We want our citizens to know if they have any type of Street Department concerns or problems they can call us and we will handle the problem in a timely manner. We strive to do this in a most cost-effective way. Stray dogs and dead animals are picked up by the Lebanon Street Department. Live cages (deposit required) are available for other small animals. All dogs will be kept for Three days at the Street Department for owners to contact and retrieve their dog. Owners will pay a fine and room and board fees along with showing proof of current shots before dog will be released. All owners may come to 1301 Lafayette Avenue to obtain a dog license with proof of current shot record. All dog licenses are free to city residents. The City offers two types of Recycling services for residents. The city has curbside Recycling where residents may have their recycling picked up every other Wednesday at their home for a small fee on their Lebanon Utilities bill. 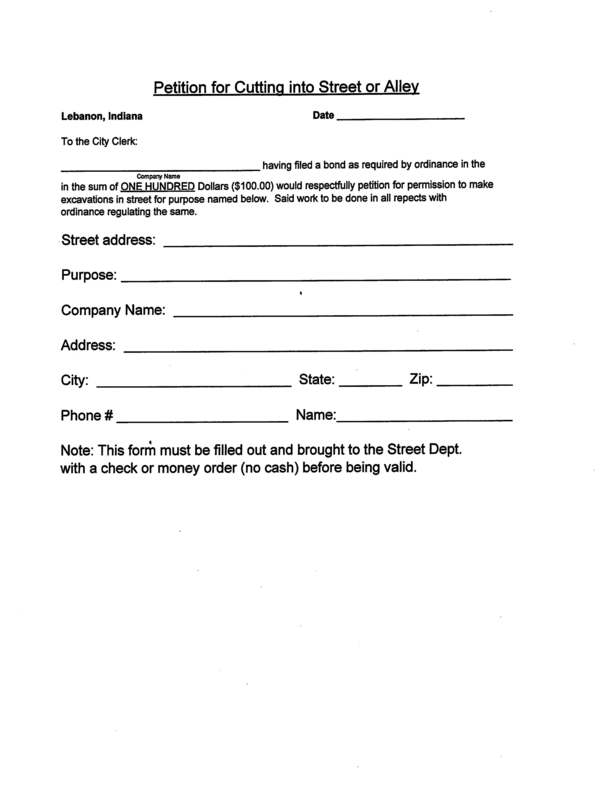 Residents need to contact Lebanon Street Department at 765-482-8870 to set this up. Residents who have curbside recycling will have a recycling bin dropped off for them to use. Please use only this bin, it is the only thing they will pick up. If you have questions, call Ray’s Trash Service at 1-800-531-6752. Residents may also utilize the drop off recycling at 1301 Lafayette Avenue on Monday through Friday each week. The hours are from 7:30am to 3:30pm and on the 1st and 4th Saturday recycling is open from 8:00 a.m. to Noon. Residents may come into the office to pick up a paper on what they may or may not bring to recycle. WE DO NOT HAVE A PLACE TO DROP OFF USED OIL AT THIS TIME. ALL USED OIL MAY BE TAKEN TO ADVANCE AUTO PARTS, WALMART, BIG-O TIRE, OR CHECK WITH ANY RETAILER THAT SELLS OIL. Maintenance of Streets, Alleys, Right-of-WaysWe take care of all City Streets by sweeping them and filling potholes throughout the year. Every year, as needed, selected streets and alleys are repaved. We also take care of all City signs. If you have a sign that is in need of repair please go to the forms on this website and fill out the information. Street Sweepers will periodically come by and sweep your streets. The sweepers pick up debris off the road and spray water down to clean the road. Leaf Season will start the third week of October. Again, we are asking residents to put their leaves out on the street next to the curb, away from parked cars, signs, telephone poles, or any other object that would keep the leaf machine from getting to the leaves. Leaves will be picked up the same day as your trash is picked up unless it rains and the leaf machines will not run in the rain. Leaves will be picked up the following day or when we are able to get to them (weather permitting). Leaf Machines will not be able to pick up any tall decorative grass clippings, garden plants, or flowers. This will have to be bagged up to put out with your trash or call Ray’s Trash Service to make other arrangements. Limbs cannot be mixed with leaves or leaves will not be picked up. Limbs will not be picked up during leaf season. All city residents may bring their limbs to the Lebanon Street Department at 1301 Lafayette Avenue. Any resident that cuts down a tree the limbs will have to be taken to GreenCycle at 4227 S. Perry Worth Road.